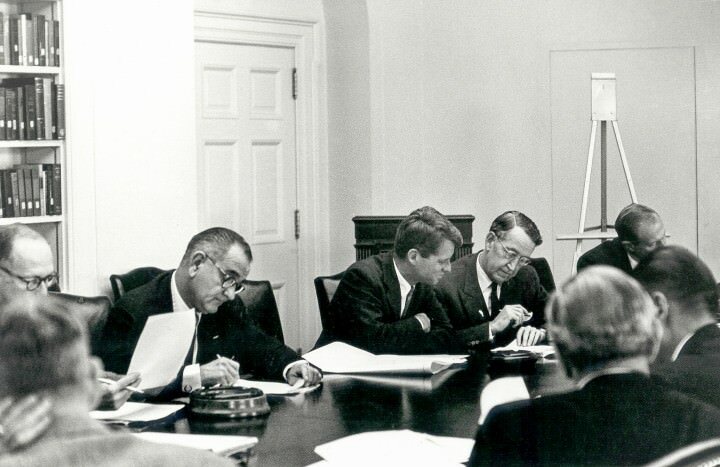 The Executive Committee of the National Security Council (ExComm) meeting in the Cabinet Room on October 29, 1962. Photo by Cecil Stoughton / JFK Library. Vice President Lyndon Johnson rarely spoke up during ExComm meetings–so much so that even listening to the recordings of the meetings it’s often not evident he was even present. Although he didn’t make it to every ExComm meeting, he made it to most of them. He attended 37 of the total of 42 meetings of the ExComm between the group’s creation on October 22, 1962, and being disbanded in March 1963. The first one he missed was the 28th ExComm meeting on November 20, 1962. The meetings obviously made an impression. Years later he would sometimes refer back to the top secret White House discussions during those perilous weeks. They’re not comprehensive by any means, but in several cases they provide details that aren’t available elsewhere. Johnson wasn’t the only person in the room keeping notes. In addition to the official notetaker–usually Bromley Smith–others, like Paul Nitze, Roswell Gilpatric, Roger Hilsman, and Harlan Cleveland kept notes. Even JFK himself had a habit of doodling. But as an added bonus with LBJ’s notes, some anonymous and enterprising secretary or aide on LBJ’s staff had the foresight to type them up. A processing note by Regina Greenwell, a senior archivist at the LBJ Library, suggests it was probably Colonel Howard Burris, LBJ’s chief aide on national security and military matters (the notes are located in the Vice Presidential Security File, which consists largely of Burris’s files). But the upshot is that we don’t have to try to decipher LBJ’s handwriting. They’ve done a much better job of making sense of his scrawl than I could have. But a few words of caution. Some of the notes include dates, some don’t. Some are incorrectly dated. With most of the undated notes I’ve identified a date by comparing the substance of the notes with other records of the meetings, especially Kennedy’s tapes. With some it’s straightforward. As an example, in one undated note, LBJ wrote of Robert McNamara discussing called up “300 Reserve Troop Carrier Transports.” That matches directly with the transcript of the morning meeting of October 27. But not all of the notes match obviously to a particular meeting. As for the times of day, the ones used below are usually the ones written on the notes. But they don’t always align to the minute–or even the quarter hour–with the meeting times identified from other sources. In short, while I’m reasonably confident in most of the date-note matches here, I’d recommend caution in citing them (and please let me know if you spot errors so I can fix them). Whichever secretary or aide was responsible for collecting and typing LBJ’s handwritten notes was probably the person who prepared this table of contents. But they were evidently relying on the dates LBJ himself wrote on each note. And sometimes he didn’t. The undated notes don’t appear in this list, so it’s incomplete. The typed page of these notes is actually a combination of notes from two separate meetings. The handwritten date of October 23 should be October 22. 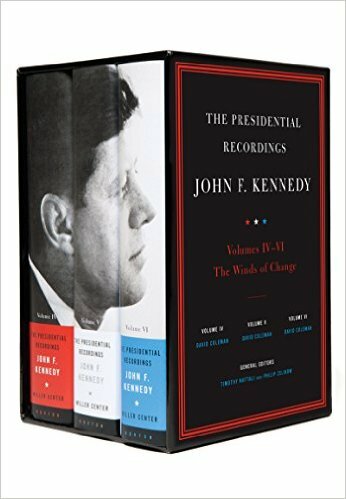 The top section is from John McCone’s briefing that led off the October 22 briefing of Congressional leaders at 5:30 P.M. on October 22, about 90 minutes before President Kennedy gave his televised speech from the Oval Office. Senator Russell’s remarks were made during that discussion. This was also the same meeting that LBJ recalled years later in criticizing Senator Fulbright’s evolution from Cuba hawk to Vietnam dove. The section that starts with “6 P.M. Tuesday – ExSubCom” is from the evening meeting on October 23. This brief note is undated and separated from the one above in the original file, but it probably refers to the approach toward of the quarantine line of the Kimovsk, which was discussed in the October 23 morning ExComm meeting. This note is undated, and there’s not a lot to go on. My guess is it referred to news first arriving that the ships were turning away from the quarantine line on October 24. Although Johnson doesn’t appear in the transcript of this meeting, his Daily Diary appointment book indicates he attended. But ships returning to the Soviet Union was something that came up often in coming days and weeks. This note is incorrectly dated. The substance of this note tracks directly with the recording of the October 25 morning ExComm meeting. This note is dated as October 26 at 10 AM but doesn’t track well with the transcript of that meeting. It probably is a combination of notes including, quite possibly, a breakout staff-level meeting. This note is also pretty cryptic. In the original file it doesn’t follow sequentially from the pages above. Santiago, Cuba, was mentioned in the October 24 and October 26 ExComm meetings. There are several undated notes scattered through the file that seem to be from October 27, widely regarded as the darkest day of the Cuban Missile Crisis. On that day, in addition to morning ExComm meetings, there was a rolling and lengthy session of meetings during the afternoon and stretching into the evening. Although the original is undated, McNamara’s comments are a giveaway that this was from the first meeting on the morning of October 27 (9 AM). These notes are probably from the 10 AM meeting, although the topics came up several times during the day. This one is clearly from the 4 PM ExComm meeting, which is when McNamara reported the surveillance plane being hit by a 37 millimeter shell. This short note corresponds to the chronology of the sessions during the afternoon and evening. This note is misdated. The substance of the note tracks directly with the recording of the morning meeting on October 31. Kuznetsov and the Red Cross weren’t in the picture on October 24. This was the first of two ExComm meetings this day. And this was the second. There were two ExComm meetings on this day, and there are corresponding notes for each. But it’s not clear what this note records. It may have been a summary of a discussion, or it might have been some ideas LBJ was jotting down to clarify his own thinking. These notes correspond to the first of two ExComm meetings on November 12. This meeting took place over a week after the November 20 deal, but the ExComm was still meeting regularly and spending much of its time on Cuba. National Security Adviser Walt Rostow compiled this consolidated list in October 1968 laying out the ExComm meetings LBJ attended. For comparison, I’ve compiled a list of all the ExComm meetings with corrected times.